Please send me a free eSignal indicator! The information delivered here is for educational purposes only and is not intended to be a recommendation to purchase or sell any of the stocks, futures or other securities referenced. All references are for illustrative purposes only and are not considered endorsed or recommended for purchase or sale by MC Trading. Trading Forex, Stocks and Options, Futures and any Commodity or ETF contains substantial risk and is not for every investor. An investor could potentially lose all or more than the initial investment. Risk capital is money that can be lost without jeopardizing ones financial security or life style. Only risk capital should be used for trading and only those with sufficient risk capital should consider trading. Past performance is not necessarily indicative of future results and no representation is being made that any account will or is likely to achieve profits or losses similar to those shown. MCTrading has taken reasonable measures to ensure the accuracy of the information contained herein and on this website, however MCTrading does not guarantee its accuracy and is not liable for any loss or damage which may result directly or indirectly from such content or from an inability to access such information or any delay in or failure of the transmission or receipt of any instruction or notification in connection therewith. WHY ARE THE MARKETS IGNORING THE TREASURY INVERSION? ARE INVESTORS BLIND TO THE EQUITIES UPSIDE SUPER CYCLE? ES #F Supply Galore – Bull trap! ARE YOU READY FOR THE NEXT BIG MOVE IN GOLD? MARKET FORECASTING YOU JUST CANT BEAT! US DOLLAR SET TO RALLY AND GOLD COLLAPSE? US INDEXES REACHES FIBONACCI TARGET ZONE – WHERE TO NEXT? GOLD HITS OUR $1300 PRICE TARGET – WHAT NEXT? HOW TO SPOT A TRADABLE MARKET TOP? NATURAL GAS THROUGH OUR $3.20 TARGET – WHAT NEXT? IS A DELEVERAGING EVENT ABOUT TO UNFOLD IN THE STOCK MARKET? Matrix for guidance on what to expect the market reaction will be, after economic announcements! IS A TOP FORMING IN NATURAL GAS? WILL OIL FIND SUPPORT NEAR $60? ES #F Supply but Selling pressure easing? Batten Down The Hatches, Mates! ES #F Highest Supply since previous sell-off? TRANSPORTATION BREAKDOWN HINTING TO GLOBAL ECONOMIC WEAKNESS? WILL OIL FOLLOW HISTORICAL PATTERNS? GC #F We can see Gold at 1239.60 at about the 10th of this month? BTC #F Demand - Bitcoin on the rise again? ARE TECHNOLOGY AND FANG STOCKS BOTTOMING? FALLING STOCK PRICES DURING US ELECTIONS? ES #F Demand, inside bar? ES #F Weakness, Supply, Strong close? ES #F Demand, strong close, overnight weakness? ES #F Supply but strong close? ES #F Supply increased, 3-Day turning bearish? ES #F Supply increased, but no new low? ES #F Demand with large unfilled gap? ES #F Sideways what next? ES #F Supply dominating session, caution for Monday! ES #F Dominating demand, what next? ES #F Up move then closed down? ES #F Difficult up ward progress? ES #F Trading at crossroads with 100% Positive Sentiment? ES #F Is the market getting ready to roll over? Today is a Holiday in the USA. Blessings and piece! Happy Thanksgiving! ES #F Down and Up, now what? ES #F Buying and no rally? ES #F It did not hold? ES #F Will it hold? ES #F Absorption or Distribution? ES #F Break out upwards? ES #F Pullback and now what? ES #F Down and up? ES #F Continuation of down trend? ES #F Swift sudden pullback? ES #F Pullback and continuation? 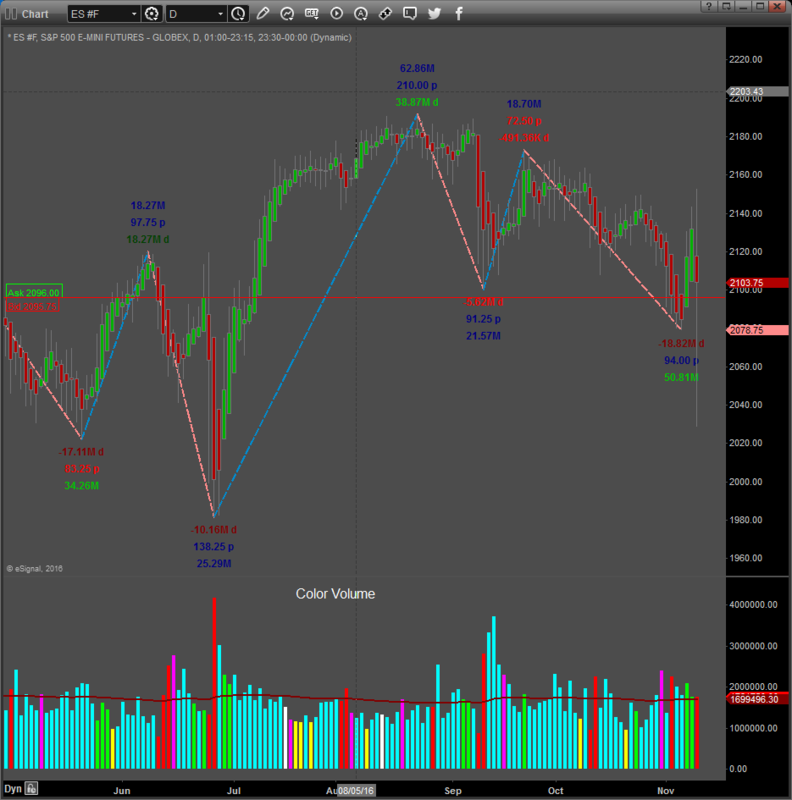 ES #F Daily chart outlook: Low volume rallies on daily chart, signs of what can be expected in the near future? ES #F No clear signals? ES #F Pullback or reversal? ES #F How big will this bounce be? ES #F Sideways and down? ES #F Up move sustainable? ES #F Getting ready for next move up? ES #F Set for another new high? ES #F More selling to come? ES #F Bearish change in behavior? Follow through in ES needed? ES #F possible bearish change?